Subtitled: Containing Selections from the Various Departments of Painting, Sculpture, Architecture, History, Biography, Art-Industry, Manufactures, Scientific Inventions and Discoveries, Local and Domestic Scenes, Ornamental Works, etc, etc.. The Illustrated Magazine of Art was a successor to The Illustrated Exhibitor and Magazine of Art. It contains an eclectic assortment of articles on art, life and culture. It proved not to be a success and ceased after 24 issues. . 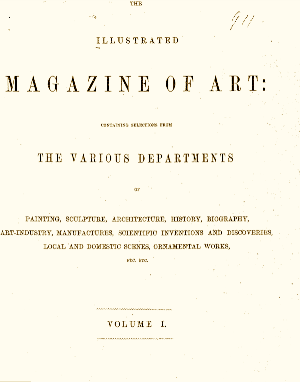 The title was revived in 1878 as The Magazine of Art.